How to migrate as many Exchange mailboxes as possible to a newtarget environment within a few weeks? Is it possible to migrate 1,000 mailboxes perday? The project was realized with Dell / Quest Migration Manager forExchang and Multiple Agent Hosts. The challenges of this Exchange migration were therequirements of the customer, who wanted to migrate a large numberof mailboxes in a short rollout period. The project was launcheddue to a provider change. Dell / QuestMigration Manager for Exchange should be used as migration toolfor this project. To meet this requirement, it was necessary tocreate a setting, which allows to convert at least 1,000mailboxes per day. The 1,000 mailboxes per day were distributed in fourRollout groups to reduce the dependencies to a minimum.The synchronization of the data of each mailbox began 7 days beforethe conversion. To ensure a high data throughput, the distributionwas split to 20 QMM mail-source agents and 20 QMM mail targetagents (parallelization). With a lead time of 7 days, the roll outwas running with an average of 4,000 mailboxes in thesynchronization. As a result, only a few changes had to betransferred at the transition date, the Source mailbox had to bedisabled and the target mailbox to be enabled. The user was advised in a last e-mail that his mailbox has beenmoved. In that email, the user is asked, to run a program, whichcloses Outlook and switches the users Outlook profile automaticallyto the target environment. In this way, a lot of migrations per daywere possible and it was ensured that the end users only had abrief interruption during their working time. 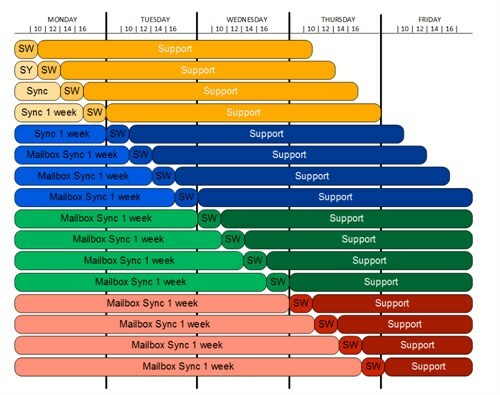 In addition, 20 Calendar Synchronization Agents distributed on 4Agent Hosts enabled all 40,000 mailboxes to synchronize allcalendars at the same time as well. 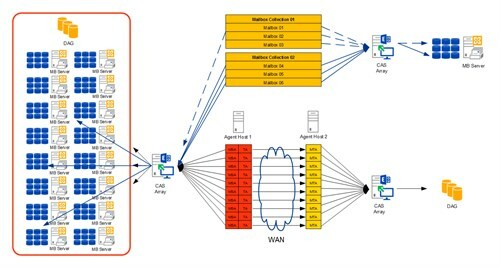 By parallelizing the mailbox export and importfunctions on 8 servers with a total of over 60 agents andthe organizational division during the rollout to multiple”migration waves” per day, all requirements have been met. All40,000 mailboxes have been migrated within the given 8 weeks. ⇒ It is possible to migrate 1,000 mailboxes per day with Dell /Quests Migration Manager for Exchange. Do you need support for the planning or realization of your Exchange Migration?